Science in the Ancient World is the second book in a hands-on, multilevel elementary science series that introduces scientific concepts using history as its guide. Because each lesson is built around an activity or experiment, it is engaging for all K-6 students. In addition, there are three levels of review for each lesson, so the parent/teacher can choose the depth at which each student is expected to grasp the material. The course contains roughly 90 hours of instruction, 35 of which are composed of hands-on activities. The course covers the scientific work of natural philosophers who lived from about 600 BC to the early AD 1500s. It concentrates mostly on what these ancient scientists got right, but it does spend some time discussing what they got wrong, because even the mistakes that scientists make can sometimes advance our understanding of the natural world. Of course, when the students are taught something that is now known to be incorrect, they are made aware of this fact! Because the course covers science as it was developed, it covers a wide range of topics including human anatomy, medicine, optics, heliocentrism, geocentrism, sound, music, magnets, how steam is used to generate power, the motion of objects through a medium, combustion, levers, pulleys, plant growth, plant anatomy, tree ring dating, the atmosphere, astronomy, the basics of graphing, plastics, density, water flow, friction, and erosion. 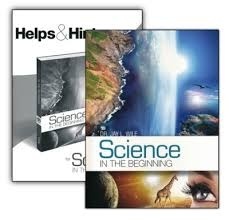 Throughout the course, students learn that most of the great scientists who lived from AD 500 to the end of this time period were devout Christians who did science because they thought they could learn more about God by studying His handiwork. This product is a set consisting of the textbook plus the helps & hints book containing everything the parent/teacher needs to know for the subject.